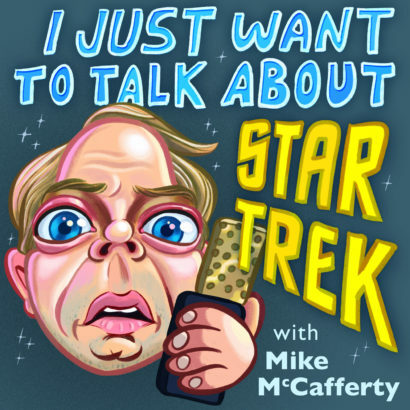 Mixing the deep dive facts with absurd comedy, Mike McCafferty is on a quest to talk about Star Trek with fans, people who have worked on a series, or just a random person he meets on the street. Q’plah! Mike McCafferty is a writer and comedic actor. As a writer, he has written pilots for Nickelodeon, Fox, Adult Swim, as well as web content for Funny or Die, Awesomeness and Channel 101. Recently, Mike traveled to Wyoming to shoot the pilot “50 States of Mine,” a supernatural travel show that he wrote, starred in and broke two ribs for! As an actor, he’s logged over 100 hours on TV and film, bringing funny to a range of shows including “Rick and Morty.” “Key and Peele,” “True Blood,” “Idiocracy,” “Community,” and the Hallmark film “Operation Cupcake,” nominated for zero Emmys! Mike has a Masters degree in Theatre Arts and teaches improv and acting at AMDA university in Los Angeles. He is married and has two sons that seem to express all the better genes that never showed up in his own DNA.